Business leaders looking for places to locate or expand operations often consider the stability of government financial operations as a key factor in their site selection decisions. When current levels of taxation and service provision are not sustainable, it creates uncertainty about the location’s long-term viability as a place to invest, live or work. 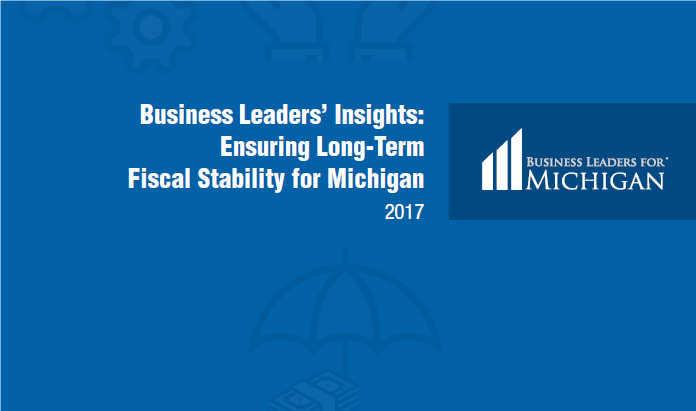 Michigan has a history of being more fiscally unstable than the average state, due to a traditionally heavier reliance on manufacturing. Michigan has had a tendency to out-perform the nation during economic recoveries and under-perform during periods of recession. These trends result in tax revenues that vary widely from year to year, making budget and economic planning a challenge for state and local officials. In addition, stagnant population growth and an aging population have increased taxpayer demand on public services. The nearly decade-long recession Michigan experienced in the 2000’s placed significant pressure on the people of Michigan and left many local units of government in fiscal distress. State leaders responded by passing the Local Financial Stability and Choice Act (Public Act 436 of 2012) to address the growing number of local governments and school districts with unusually high levels of economic hardship. The City of Detroit filed for bankruptcy in 2013, and Michigan has had four school districts cease operations due to fiscal insolvency (Highland Park, Buena Vista, Inkster, and Muskegon Heights). Moreover, Detroit Public Schools recently came very close to insolvency. Michigan has made considerable progress recovering from the last decade. Recent state tax, fiscal and regulatory changes have created a better business climate and more people are back to work. Still, many challenges remain. Michigan’s Department of Treasury is currently engaged in 11 cities and one county due to the fiscal distress these governments are exhibiting. In FY 2015, 41 charter and traditional school districts finished their fiscal year in a deficit position (Whiston, 2015).